Katrina Scallin’s new book “Starla The Star Hanger” is a spiritual and imaginative children’s book that’s uplifting and perfect for all ages! Recent release “Starla The Star Hanger” from Page Publishing author Katrina Scallin is a wondrous and spirited adventure of a girl named Candice who saves an angel that’s in trouble. Will Starla ever make it home? 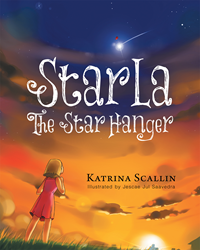 Katrina Scallin, a first time author, has completed her new book “Starla The Star Hanger”: an adventurous and sensational story of a lost angel trying to find her way home. Through her faith and prayers will Starla make it back to the North Star? Katrina and her husband of 31 years Joe, live on a two acre farm in central Georgia and raise goats and chickens. They have two teenage sons, Tyler and Jay Jay. Katrina has spent most of her adult life working in children’s ministries. Her passions include Gospel Clowning and Gospel Illusions. She has trained puppeteers as well as Gospel clown troupes while working as a children’s minister both stateside and abroad. Published by New York City-based Page Publishing, Katrina Scallin’s courageous tale that teaches the lesson that with enough faith and prayer God will put a person exactly where they need to be. Candice never imagined the wacky adventure she would have while out catching fireflies. Or that she would meet an angel in trouble, trying to get home. She takes her new friend, Starla, home to try to find a solution. Through her prayers and with help from God she is able to help Starla back to the North Star. Readers who wish to experience this faith confirming work can purchase “Starla The Star Hanger” at bookstores everywhere, or online at the Apple iTunes store, Amazon, Google Play or Barnes and Noble.